Shield- The Shield symbolizes steadfast principles, commitment, loyalty and protection, which are afforded us by taking up the spiritual “Shield of Faith” in Christ. Building/Monastery- The building at the centre is meant to symbolise a monastery. At the time of St. Colmcille, monasteries were centres of learning and education. Triangle (plus subset of 3 triangles) - Due to the fact that triangles contain three corners and three sides they are often linked to different trinities. As a Catholic school the trinity it symbolises for us is that of the Christian faith, the holy trinity- father, son and Holy Ghost. This is emphasised in our crest as we do not only have one triangle, but actually three. Colm Naofa Banner - This identifies our school’s Patron Saint, St. Colmcille, who set up a monastery only a few miles from Tullamore at Durrow. Colour red - Red can symbolise strength, power, determination as well as passion, desire, love, warmth, energy, passion and courage. Colour blue- Blue is the colour of the sky and sea. It is often associated with depth and stability. It symbolizes trust, loyalty, wisdom, confidence, intelligence, faith, truth, and heaven. Colour white - White is associated with peace, professionalism, loyalty, reliability, honour, trust and professionalism. St. Columba's / Coláiste Choilm? The school's name has always been St. Columba's/Coláiste Choilm. However, the school was known locally for a large portion of it's history as Tullamore CBS (Christian Brothers School). After the Christian Brothers handed over the trusteeship of the school to the Diocese of Meath in 1999, the school was obliged to reflect this new trusteeship. It was decided to re-emphasise the offical title of the school as being St. Columba's/Coláiste Choilm. Through constant use of the 'as Gaeilge' version, Coláiste Choilm, the as Gaeilge version stuck and became the accepted name for our school. St Colmcille is one of Ireland’s three patron saints. The other two are St Brigid and of course, St Patrick. His feast day is June 9, the day he died in the year 597 AD – at the impressive age of 75. Colmcille was born on December 7, 521 in Gartan, near Lough Gartan in Co. Donegal. He was also known as Columba, a Latin version of Colum. The 'cille' suffix that was added to the end of his name means 'of the churches'. On his father's side, he was great-great-grandson of the famed Niall of the Nine Hostages – an Irish high king of the 5th century. The modern day Donegal village of Glencolmcille is named in his honour. Colmcille's legacy is much celebrated in his native Donegal. A young Colmcille entered the priesthood at the age of 20 when he became a pupil at Clonard Abbey, situated on the River Boyne in modern day Co. Meath. When a prince cousin gave him some land at Derry, he decided to start his own monastery. This allowed him to travel throughout Northern Ireland teaching the pagans about Christianity. Colmcille founded some 30 monasteries in just 10 years, inspiring many people with his personal holiness. Columcille founded his first monastery in Derry, on the site of the present city of Derry. It became known as The Oak-tree of Colum Cille, Doire Colum Chille, from which the present city takes its name. He soon established for himself a reputation as a scholar of scripture and a poet. Colmcille founded the monastery at Durrow. The site at Durrow was given to him by the King of the Southern Uí Neill Kingdom of Tethbe. Durrow, (Dearmach), means Field of the Oaks. The original foundation was probably constructed of timber. There is crop mark evidence of the area of the enclosure. It encompassed an area of 500 metres in diameter. The outer enclosure manifests as a double bank. The sculptured High Cross at Durrow has scenes from the Old and New Testaments. The Book of Durrow was also created in Durrow Monastery. Nevertheless, Colmcille was no angel. His strong personality and forceful preaching ruffled feathers and in 563 AD he was accused of starting a war between two Irish tribes. After the death of Prince Curnan of Connaught – who Colmcille was meant to protect – a number of clerics and scholars threatened to excommunicate him. Instead, Colmcille was sentenced by the high king never to see Ireland again, and was exiled to Scotland with 12 companions. He settled on a bleak Scottish island called Iona where he would spend most of his remaining years. In 575 Colmcille was persuaded to visit Ireland to mediate a dispute between the high king and the league of poets. Insisting on remaining faithful to the terms of his exile, that he never ‘see’ Ireland again, he travelled blindfolded. His considerable reputation was respected by everyone in Ireland. He spoke to the assembled nobles and clergy with such force and authority that the king was persuaded to calm hostilities. 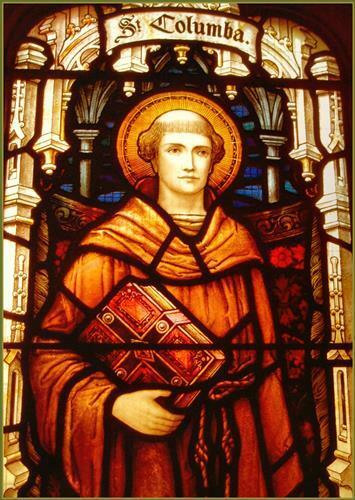 Colmcille spent the rest of his life on Iona praying, fasting, and teaching his monks to read and copy the Scriptures. He was a renowned ‘man of letters’, wrote several hymns and has been credited with having transcribed over 300 books and manuscripts. Colmcille died on Iona and was buried in 597 by his monks in the abbey he created. On August 22, 565, St Colmcille is said to have encountered the Loch Ness Monster – which has been interpreted as the first ever reference to the mythical Scottish beast. Traveling in Scotland, Columba had to cross Loch Ness, but Nessie had other ideas. Raising his hand to make the sign of the cross, Colmcille commanded the beast, saying, "You will go no further, and won't touch the man; go back at once." At the voice of the saint, the monster fled as if terrified, "more quickly than if it had been pulled back with ropes.” The local pagans were amazed and converted to Christianity based on the miracle. A number of miracles have been attributed to St Colmcille – such as healing people with diseases, expelling malignant spirits, subduing wild beasts, calming storms, and even returning the dead to life. He is also said to have performed ‘agricultural miracles’ that would hold a special significance to the common people of Ireland and the British Isles, such as when he casted a demon out of a pail and restored spilt milk to its container. As well as being one of the three patron saints of Ireland, St Colmcille is also the patron saint of the city of Derry – where he founded a monastic settlement in 540 AD. The Church of Ireland Cathedral in Derry is also dedicated to St Columba, as well as St. Colmcilles Primary School and St. Colmcilles Community School in Dublin. Numerous Catholic schools and parishes are under the patronage of the Irish saint showing the strength of his legacy.